The authors are with the University Hospital Utrecht, Heart–Lung Institute, Postbus 85500, NL-3508GA, Utrecht, The Netherlands. The beam profiles and spatial irradiance distributions of modified fiber tips mainly used in laser angioplasty have been calculated by ray tracing assuming a uniform spatial combined with a weighted angular irradiance distribution. The computations were compared to paraxial theory and to measurements in air and in water. For ball-shaped fibers and hemispherical probes, made of either silica or sapphire, the position of the maximum irradiance in front of the probe in water did not coincide with the calculated paraxial focal point. The maximum irradiance increase was limited by internal backward reflections and by beam divergence. 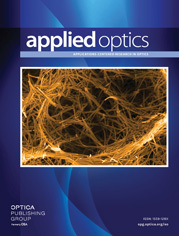 It is expected that beam focusing is minimal when optically modified fiber tips are in contact with tissue. Ray tracing is useful for optimizing the design of optically modified fiber tips when paraxial theory cannot be applied. Dependent on the refractive indices the figures for perpendicular reflection, the positions of the focal points F1 and F2 (Eqs. (1) and (2)) and the condition of a parallel beam profile (Eq. (3)) are given in relation to the radius of fiber Rf and the radius of sphere Rs.